I won't forget the date – June 9, 2009. 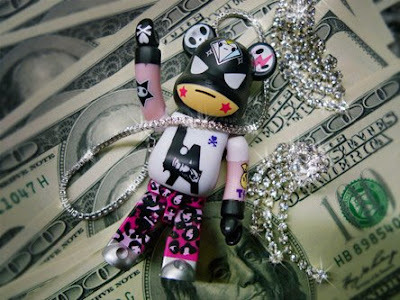 I received a notice from the post office that my L.A. Robber Bearbrick (above, designed by Simone Legno of Tokidoki) had arrived via registered airmail. I asked my driver to pick it up. Who would have known that this bearbrick with darkly whimsical markings was an omen of the bizarre coincidences that followed? I got a message from a client. He informed me that our 2 pm meeting at their office might be cancelled. He said, "Some robbers broke into our 3rd floor offices last night and all the tenants have been forbidden to enter the building since this morning.... for security reasons." My client called back to say that they've already been allowed to go up to their offices. "Let's proceed with our meeting at 2pm," he advised. I arrived (with my colleague) at the back entrance of my client's building where a crowd of people were gathered by the sidewalk. As we moved towards the door, a security guard stepped in front of us and said, "Sorry, sir, ma'm... we are securing the building. Nobody's allowed to go inside." Before I could open my mouth to speak, he had already turned his back. My colleague whipped out her cellphone and dialed our client's number. "We thought you said that we'd be permitted to enter the building already... How come we're being asked to leave?" she asked him. He apologized, "Sorry, there's been another robbery, just 20 minutes ago. Happened so fast, I wasn't able to warn you... A group of armed men held up the bank on the ground floor!" Our jaws dropped. Had we arrived earlier, we would have witnessed the whole thing! Because to get to our client's 3rd floor office, we needed to take the elevators which were right in front of the bank's glass doors. My client continued, "Meeting's canceled, of course, I'll call you people next week. Bye!" By that time, we've been ushered to the sidewalk where the rest of the crowd was milling about. I couldn't help but overhear someone say, "I heard that the two adjacent buildings were also robbed last night – can you believe it? Must have been the same thieves!" Another voice quipped, "It's election time, that's why...."
The first voice replied, "Yeah... election time." When I got into the car to go back to our office, I told my driver about what happened. He quickly commented, "That's because it's election time..."
Now, what in the world do you think they all meant by that?! Hi there! Have been looking at your blog for the past few months! It was so nice of you to take pictures with bearbricks and telling story of them. But my collection isn't as wide as yours. Seems to be a reliable website but have not buy from them. just got mine few days backand im lovin it! !